Our Poppy paperbag jeans are perfect styled with a printed t-shirt. 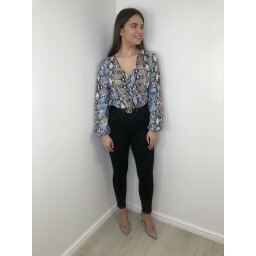 They are full length, high rise jeans with a detachable tie belt for round the waist. There are two front pockets and on the back two faux pockets. Around the waist extra detail is added from the paperbag waist. 64.8% cotton. 33.3% polyester. 1.9% elastane.